Painting on clothing can be a fun, creative way to design your own one-of-a-kind fashion pieces. 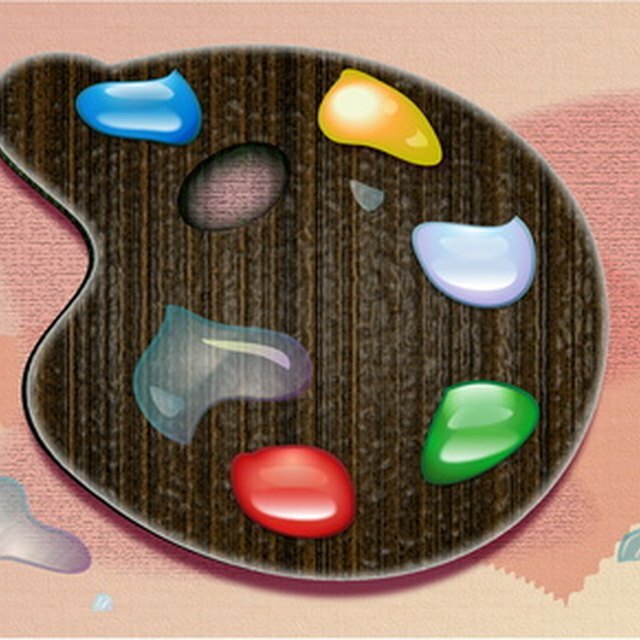 Depending on your skill level, there are various painting styles, brushes, fabrics and paints that work best. Following are some tips for painting on clothing that are educational for the beginning painter or the more advanced designer. Decide what clothing you will paint on. The fabric is important, as certain fabrics take the paint better. The best type of material is washable natural-fiber and natural-blend fabrics: 100 percent cotton, cotton/polyester blends and rayon work best. Be aware that paint colors vary on different colors or blends of fabrics. If you are a beginner, it may be best to save silk fabric for when you are more skilled. It is best to wash the fabric first; the paint will set better. Also, sometimes the subtle shrinking of the clothing from the wash tightens the fabric weave, again making it easier to paint on. Throw some water on the material and do a patch test. If water beads form, wash it before you paint. Do not use any fabric softener during the wash. This will add chemicals and affect the painting process. You may also want to press the clothing before painting. Any wrinkles, even a subtle crease, will ruin the painted image. You will need supplies. The paints can be purchased at any craft store or art supply store. Most fabric paints do not require heat setting after painting provided you do not wash the clothing immediately. If you choose to set the design with heat, wait at least 24 hours until you iron. Tulip and Scribbles fabric paints are preferable because they do not need heat setting. The label suggests, however, that you let the material dry up to 72 hours before washing. Always insert wax paper or newspaper between the pant leg or the sides of the T-shirt before you start so the paint does not run or leak to the other side. Choose your brushes, stencils or pens carefully and always test the design on a sample item made of the same material first. If you are not a skilled artist, you may choose to tape a design outline onto the clothing item, covering the outlying area so the only visible part of the clothing is the intended design pattern. Then simply spray paint inside the outline with the fabric spray paint. This is an easy way to paint clothing without having to actually paint directly onto the material with a brush or marker. If you are brave, paint directly onto the clothing with a brush. You may also use a fabric marker or bottle tip as your brush. Pour the fabric paint into a squeezable plastic bottle and hold the bottle like a pencil so you can maneuver it as you squeeze out the design. Hold it directly against the clothing and guide it along the desired pattern. Do not paint in continuous lines. Instead, make one line at a time, lift it off the fabric and start again. Put the tip in the same spot that you ended. Repeat this until you have created the desired pattern. Painting on clothing is not only a fun craft idea, but it can also be an inexpensive way to jazz up an old t-shirt or a pair of jeans. The key is work on a clean area, prepare all of your material by making sure it is washed and pressed, and then choose the design and applicator. Success is in the preparation. Do BBQ Covers Require Maintenance?